يعرض الباحثون حالة لأسرة مصابة بكثرة كريات الدم الحمراء الوراثية والذي قد يكون ناتجًا من ارتفاع في الإنتاج الذاتي لمادة الارثروبويتين. تعتبر هذه الحالة الأولى من نوعها لهذا المرض في الهند. تمثل كثرة الكريات الحمراء مجموعة متغايرة المنشأ من الحالات الوراثية التي يكثر فيها حجم الكريات الحمراء. غياب زيادة عدد الكريات البيضاء وكثرة الصفيحات يفرق هذه الحالة من مرض بوليثايثميا فيرا. في أغلب العائلات تكون كثرة الكريات الحمراء بسبب الهيموقلوبين غير الطبيعي وازدياد الانجذاب للأوكسجين. We present herein a case of 25-year-old unmarried male patient, milkman by profession, non-smoker who was born of a consanguineous marriage. He presented with a 1-year history of epigastric discomfort, pain in the left hypochondrium, easy fatigability, intermittent headache and dizziness. Examination revealed a conscious, cooperative, well-built man with a plethoric look, ruddy complexion, mild icterus, mild conjunctival injection, macroglossia with a deep median fissure, tongue tie, an accessory thumb on the left hand, a pulse rate of 52/minute regular, normal peripheral pulses and blood pressure of 110/70 mmHg. No digital infarcts, ulcers or gangrene was seen. Chest, cardiovascular system and central nervous system examinations including fundus examination were normal. Abdominal examination revealed a palpable firm liver 2 cm below the right costal margin and a palpable firm spleen 8 cm below the left costal margin. Investigations revealed a RBC count of more than 6.50 × 10 6 /μL on several occasions with normal Hb and normal leukocyte and platelet counts. Hematocrit (PCV) was more than 55% repeatedly. Peripheral blood film was hypochromic with no abnormal cells. Renal profile (kidney function tests), blood sugar, electrolytes, serum iron, serum uric acid and lipid profile were normal. Liver function tests showed a mild increase in serum bilirubin with normal enzymes. Hepatitis serology was negative. Leucocyte alkaline phosphatase and serum vitamin B-12 levels were normal. Urine exam and chest X-ray were normal. Electrocardiogram revealed sinus bradycardia. Echocardiography was normal. Abdominal ultrasound showed a normal liver and kidneys with a portal vein size of 15 mm and splenic vein of 10 mm with moderate splenomegaly. Upper gastrointestinal endoscopy showed grade 1 esophageal varices. Bone marrow (trephine biopsy from left posterior superior iliac spine) revealed hypercellular marrow with reversed Myeloid: Erythroid (M/E) ratio (1:2), active myelopoiesis, normoblastic erythropoiesis and normal maturation. Pulmonary function tests were normal. Arterial blood gas revealed an oxygen saturation of 99%. Hb electrophoresis did not reveal any abnormal Hb type. JAK-2 mutation was negative. Carcinoembryonic antigen was normal at 0.34 ng/ml (normal up to 3 ng/ml). Alpha-fetoprotein level was normal at 0.7 IU/ml (normal < 10 IU/ml). 2,3 DPG levels were normal. EPO levels checked three times were found to be elevated at 37.3, 39.7 and 63.7 mu/ml (normal 10-25 mu/ml). No erythropoietin receptor (EPOR) studies for mutations were possible. Chromosomal analysis revealed a normal male karyotype. Computed tomography scan of the abdomen (with contrast) did not reveal any evidence of malignancy in the abdomen or pelvis. Magnetic resonance angiography of the brain was normal. Of the 25 members in two generations, four of the family members excluding the index case were found to be polycythemic. Family screening [Figure 1] revealed a Hb of 18.8 g%, RBC count of 7.21 × 10 6 /μL, PCV of 56% and EPO level of 57.2 mu/ml in the sister of the index case, but she did not have any symptoms or clinical signs. Her three children (two boys, one girl) had Hb of 18.8, 22.1 and 19.2 g%; RBC count of 6.7, 7.62 and 7.93 × 10 6 /μL; PCV of 56.6, 64.8 and 61.1%; and EPO levels of 13.5, 25.2 and 13.5 mu/ml, respectively. One of the three siblings with the very high PCV was symptomatic with headache and had splenomegaly. The index case as well as the symptomatic child is being managed with periodic venesections, Aspirin and antihistaminics. Informed consent was obtained from the patient. Figure 1: Family tree of the index case with siblings and affected children. Absolute erythrocytosis can be due to hypoxia with alteration of the normal erythropoietic mechanism, inappropriate secretion of EPO, neonatal erythrocytosis, androgen therapy, Cushing's disease, truncation of EPOR and hypertransfusion, in addition to the familial erythrocytosis and idiopathic erythrocytosis. Familial erythrocytosis was first recognized as an entity by Spodaro and Forkner  in 1933. Various designations have been used to describe the clinical syndromes of erythrocytosis or polycythemia in families, such as benign familial erythrocytosis or polycythemia vera of childhood, names that stressed the non-progressive course of the disease, its familial occurrence and the fact that secondary causes of erythrocytosis were not evident. Subsequent studies of these syndromes revealed variant Hbs: Chesapeake, J (Capetown), Yakima, Kempsey, and Rainier, with an autosomal dominant inheritance. Davey et al. found erythrocytosis in a brother and sister, off-spring of a second cousin marriage and raised the question of recessive inheritance. A mutation in the regulation of 2,3 DPG can result in one form of dominant erythrocytosis. Erythrocytosis due to autonomous EPO production was discussed by Distelhorst et al.,  Dainiak et al, and Yonemitsu et al. In the family studied in the current report, extensive investigations revealed an abnormally high EPO in members of the family with elevated Hb and hematocrit with no other secondary cause for the same, suggestive of an erythrocytosis due to an autonomous EPO production. A leading difficulty in defining the mechanism in familial erythrocytosis is lack of a suitably sensitive assay for EPO. It is likely that multiple mechanisms for familial erythrocytosis will eventually be recognized, each related to one of the steps in the regulation of erythropoiesis. De La Chapelle et al. found a mutation in the EPOR gene as the most probable cause of erythrocytosis in a family consisting of at least 33 affected living members descended from a couple five generations back. Emanuel et al. reported studies of two extensively affected families with familial and congenital erythrocytosis with 15 affected individuals and another isolated case. In all three families, secondary causes were ruled out, EPO levels were normal or low and no evidence of rearrangement or amplification of the EPOR gene could be demonstrated. He concluded that the erythrocytosis in these families that did not involve the EPOR may have resulted from alterations in the post receptor response. Kralovics R, Prchal JT. Congenital and inherited polycythemia. Curr Opin Pediatr 2000;12:29-34. Prchal JT. Primary polycythemias. Curr Opin Hematol 1995; 2:146-52. Kontras SB, Romshe C. Primary familial erythrocytosis. Am J Dis Child 1967;113:473-6. Juvonen E, Ikkala E, Fyhrquist F, Ruutu T. Autosomal dominant erythrocytosis caused by increased sensitivity to erythropoietin. Blood 1991;78:3066-9. Pearson TC, Lewis SM. Non-leukaemic myeloproliferative disorders. In: Hoffbrand VA, Lewis SM, Tuddenham EGD editors. Postgraduate Haematology. 4 th ed. Oxford: Butterworth Heinemann; 1999. pp. 505-29. Spodaro A, Forkner CE. Benign familial polycythemia. Arch Intern Med 1933;52:593-602. Adamson JW, Stamatoyannopoulos G, Kontras S, Lascari A, Detter J. Recessive familial erythrocytosis: Aspects of marrow regulation in two families. Blood 1973;41:641-52. Weatherall DJ. Polycythemia resulting from abnormal hemoglobins. N Engl J Med 1969;280:604-6. Davey MG, Lawrence JR, Lander H, Robson HN. Familial erythrocytosis. A report of two cases, and a review. Acta Haematol 1968;39:65-74. Stamatoyannopoulos G. Familial erythrocytosis. Birth Defects Orig Artic Ser 1972;8:39-45. Distelhorst CW, Wagner DS, Goldwasser E, Adamson JW. Autosomal dominant familial erythrocytosis due to autonomous erythropoietin production. Blood 1981;58:1155-8. Dainiak N, Hoffman R, Lebowitz AI, Solomon L, Maffei L, Ritchey K. Erythropoietin-dependent primary pure erythrocytosis. Blood 1979;53:1076-84. Yonemitsu H, Yamaguchi K, Shigeta H, Okuda K, Takaku F. Two cases of familial erythrocytosis with increased erythropoietin activity in plasma and urine. Blood 1973;42:793-7.
de la Chapelle A, Sistonen P, Lehväslaiho H, Ikkala E, Juvonen E. Familial erythrocytosis genetically linked to erythropoietin receptor gene. Lancet 1993;341:82-4. Emanuel PD, Eaves CJ, Broudy VC, Papayannopoulou T, Moore MR, D'Andrea AD, et al. 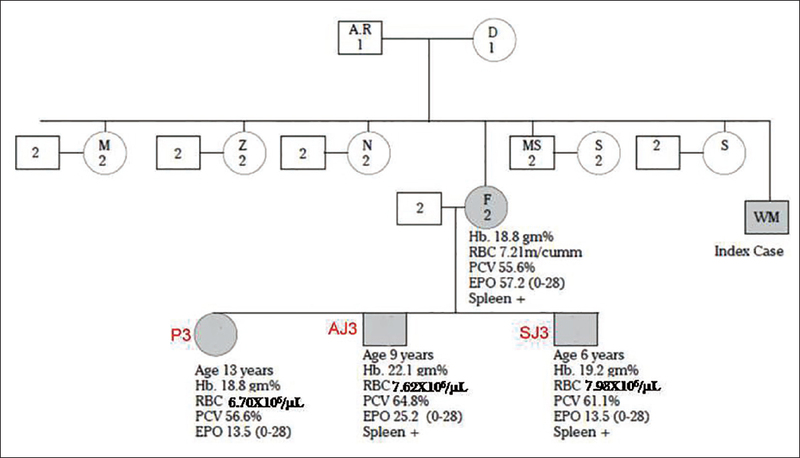 Familial and congenital polycythemia in three unrelated families. Blood 1992;79:3019-30. Sergeyeva A, Gordeuk VR, Tokarev YN, Sokol L, Prchal JF, Prchal JT. Congenital polycythemia in Chuvashia. Blood 1997; 89:2148-54.